Washington Life and Saks Fifth Avenue partnered the perfect pas de deux with The Womens’ Committee of the Washington Ballet on September 20 for a night of fashion, dance and martinis to celebrate the season opener: Septime Webre’s “Carmen/Nine Sinatra Songs / Serenade,” running November 2-6 at the John F. Kennedy Center. Sinatra was the theme of the evening— his music, his hip joie de vivre, and his sophisticated style that Washingtonians and the “Rat Pack” alike adore. The holiday fashion preview was modeled by company dancers, board members, womens’ committee volunteers and their spouses and children. It was a night with all the right moves for the Washington Ballet. For an evening at the ballet, or a night on the town. Empire, goddess gowns that drape and flow or sensuously hug the body in ruched curves. Real or faux Jet beads, gold, tassels, glamorous gems, oversized cocktail rings and exotic chandelier earrings—but watch the proportion of necklace to earrings! Morgann in Martin Grant black cocktail dress and Chanel pearl belt and shoes. Aaron in Dolce& Gabbana Brocade blazer; Armani tuxedo pants, and Zegna French Cuffed shirt and black silk tie. Jeté Society Steering Committee, wearing Favourbrook wine velvet tuxedo and black wildabout- cashmere turtleneck. Washington Ballet Board, and Womens’ Committee member, in Melinda Eng Peacock blue chiffon gown, white mink capelet and Stuart Weitzman sandals. 2005 Ballet Gala Chair, in Carmen Marc Valvo Black velvet strapless gown with pink tulle trim and Prada black suede platform pumps. who attends the Maret School and the Washington Ballet School, in Cynthia Steffe Boho chic velvet dress and gold Manolo Blahnik flats. Women’s Committee member, in Carlos Miele purple chiffon gown and fur and silk shrug with Isaac satin heels. Womens’Committee member, in Armani black velvet dinner jacket and cashmere skirt with Stuart Weitzman black satin heels. Washington Ballet dancer, in Melinda Eng burgundy tulle dress and Gucci horsebit patent pumps. President of the Women’s Committee, in Wayne Clark bronze taffeta cocktail dress and Prada mules. 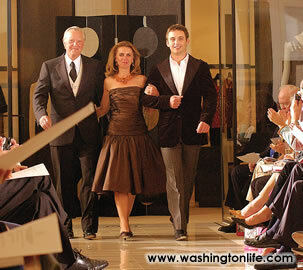 Husband, BOB WOZNIAK in Canali tuxedo, Saks Tuxedo shirt, Carrot and Gibbs vest and Brioni silk tie. Son, FARID WOZNIAK, in John Varvatos pinstriped slacks, dress shirt, and Corduroy tuxedo blazer with Gucci boots. SEPTIME WEBRE, Artistic Director of the Washington Ballet and KAY KENDALL, president of the Board of the Washington Ballet. Septime in Armani velvet tuxedo and Favourbrook black ruffled dress shirt. Kay in Oscar de la Renta tulle and sequined cocktail dress with Manolo Blahnik gold sandals. Washington Life is proud to sponsor this year’s Washington Ballet’s NUTTY OR NICE BALL featuring a gala reception with dinner and dancing immediately following the opening of Septime Webre’s The Nutcracker at the Willard Intercontinental Hotel on December 2; with chair Gahl Hodges Burt. for their gracious and fashionable hospitality: Catherine Bartels, General Manager; Andrew Blecher, public relations and fashion director; Brian Dire; Susan Neimann and Ridgewells for catering the evening. Also, special thanks to Armani Cosmetics for models makeup; Mary Bird, assistant director for the Womens’ Committee; all the volunteers who made the show so memorable; and Heidi Schroder, Special Events Director of the Washington Ballet.